Samantabhadra (also Viśvabhadra, 普賢 Chinese: Pǔxián; Japanese: Fugen) is the Lord of the Truth (理) in Buddhism, who represents the practice and meditation of all Buddhas. Together with Shakyamuni and fellow disciple Manjusri he forms the Shakyamuni trinity. He is the patron of the Lotus Sutra and, according to the Avatamsaka Sutra, made the ten great vows which are the basis of a bodhisattva. Samantabhadra is most commonly described as a bodhisattva himself, although some esoteric traditions regard him as a primordial Buddha. Literally ‘He whose bounty is omnipresent’, he represents the Buddhist ideals of Law and Compassion. 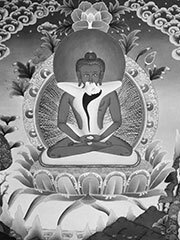 He is often associated with Manjushri, alongside whom he is one of the three acolytes of Shakyamuni. In Japan this Bodhisattva is mainly worshipped by the Tendai and Shingon sects, and as the protector of the Lotus Sutra by the Nichiren sect. Samantabhadra was formerly looked upon among Tantric Buddhist sects as the Primordial Buddha, awakened since the very beginning; but his popularity diminished when the dKar-hGya-pa (Red Bonnets) and dGe-lugs-pa (Yellow Bonnets), set up Vajradhara as the Adi-Buddha. Certain of the Yogacharya sects claim that Samantabhadra, instead of Vairochana, was the founder of the Yoga system, and look upon him as the divinity of Religious Ecstasy. Indeed he is the special divine patron in Japan of those who practise Hokkesammai (ecstatic meditation). Unlike his more popular counterpart Manjusri, Samantabhadra is only rarely depicted alone and is usually found in a trinity on the right side of Shakyamuni, mounted on a white elephant. In those traditions that do accept the Avatamsaka sutra as its root instruction Samantabhadra and Manjushri flank Vairocana Buddha, the central Buddha if this particular sutra. Puxian is sometimes shown in Chinese art with feminine characteristics, riding an elephant with six pairs of tusks while carrying a lotus leaf parasol, with similar dress and features to some feminine depictions of Kuan Yin. Among those esoteric traditions that treat Samantabhadra as the Primordial Buddha, he is always represented naked, with a dark blue body, in union with his consort Samantabhadri.